Whether you realise it or not, the front door to your home or property is very important. Along with your windows and brickwork, it is one of the first things that people will notice about your house. Doors not only provide protection and security to your home but it can also create the all-important first impression. People’s eyes are naturally drawn to the door as they approach your house so choosing the right door has a huge impact on the look and feel to it. 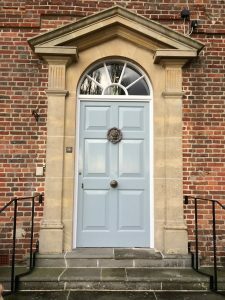 Dorset, Hampshire, Somerset and Wiltshire have some of the most historic and beautiful homes in the country and you’ll want to find a door that complements your style of house. Typical Georgian door would of been a simple six panelled design without glass. The two smaller top panels may of been changed to glass in the later Georgian or Victorian period. Victorian houses tended to have narrow hallways and entrances. The front door was often made of softwood and painted, stained or grained to look like hardwood. The doors would have been panelled, divided into four or six sections with some panels filled with glass. A beautiful front door would have been very important to the Victorian home owner so it would have been well maintained with gleaming brass furniture. Edwardian houses were often built on wider plots so a side window sometimes flanked the main door letting in more light to the hallway. The front door was often large, panelled and painted with Art Nouveau or Neo-Georgian glass. It was popular to paint the doors red or green. By the Edwardian period most householders no longer had maids to scrub the step and polish the brass knockers so door furniture was finished with a maintenance free black coating. Steps were made of stone or covered with a simple sheet of metal. In addition to considering the age and architecture of your home, you need to think about the windows too. If you choose to buy a door with glass elements, the shape will need to blend in with the other glass of the home. Homeowners should also have an understanding of what it means to own a door long-term. All doors look fantastic when they’re brand new, but you need them to look just as good 20 years from now. The right company will recommend a door that not only looks great but will outlast the elements for as long as you live in your home. 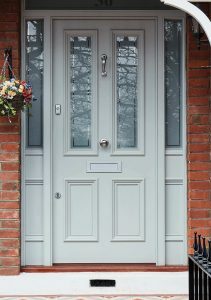 The choice of doors can seem overwhelming but the team at HRG Services are on hand to offer our years of advice on what type of door is best for you and your home, giving you the peace of mind your door will not only look the part but will keep your home safe and secure for years to come. For more information on doors please visit our main page or call us on 0800 246 1947.